Spam comments on your Instagram photos are annoying. Ads and inappropriate comments can damage your brand’s credibility and they’re not just attractive. Typically spam bots will post similar comments such as “check out my page!” or “want more followers?” (Usually along with a long string of emoji’s to draw more eyes to their comment.) Recently, I started getting bot comments as soon as I posted a photo. It was always the same with two separate comments telling me to check out their account. Since I was still actively using the app, I was able to delete the comments quickly, but it became extremely annoying when I had to do it after every. single. photo I posted. A photographer in a Facebook group I’m in posted tips on how to block these comments. I’m probably a little late to the game, but I had no idea this feature existed until now! It’s saved me time from having to delete the spammy comments from my feed. I thought I’d share the instructions here so you all can use this Instagram feature yourselves. 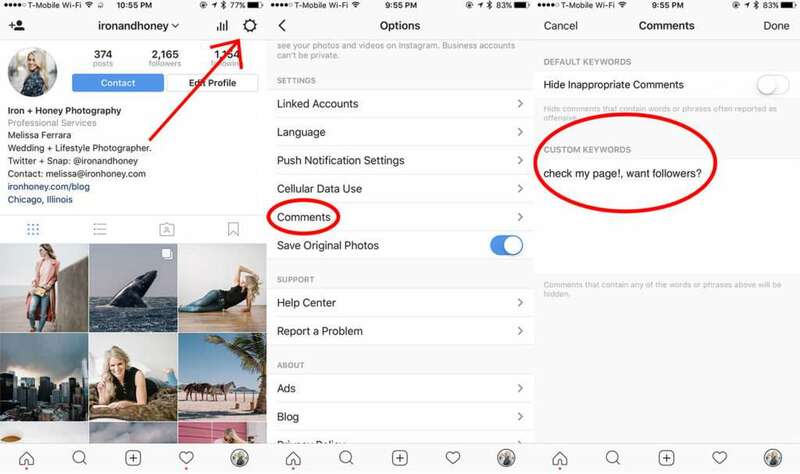 Hopefully it saves you from getting spammed with annoying comments on your Insta too! First, go to the Settings section of your account. Next, scroll down a bit and click on “Comments.” It’ll take you to a new page where you can select to block all inappropriate language, or you can list common spam phrases or keywords in the box below. Genius! The phrases I wrote are common ones I’ve seen, but you can enter in whatever keywords you like. Let me know in the comments below if you have any other Instagram tips you have to share, or if there’s anything you’d like to know! Yes! They get you twice right when you post a photo. So annoying! This has really helped – wish I knew about it before! I could kiss you right now! Thank you so much for this post!! These spammers are so annoying!